One of my recent hippie food discoveries was chia seeds. These little poppy-seed looking things are kind of like magic. When they are soaked they puff up and get this gelatinous texture almost like a pudding. Touted for their amazing health benefits, I thought I would give them a try for breakfast. Best part is that you can make this chia seed pudding the night before and then it is ready for breakfast the next morning. Perfect for busy mornings or breakfast at work. I topped mine with lots of fruit and some honey and also used coconut milk, because well coconut milk makes everything taste better. I also put some Dang coconut chips on there. Have you tried those yet? If not, run, don't walk to the grocery store (I get mine at Whole Foods). They are the perfectly crispy delicious coconut bits that are completely addictive. Give chia seed pudding a try and let me know what you think! Also do you give hippie food a yeah or nay? Combine chia seeds, coconut milk, water and maple syrup in a large mason jar. Shake well. Refrigerate chia seed mixture overnight or until the mixture becomes creamy and thick. 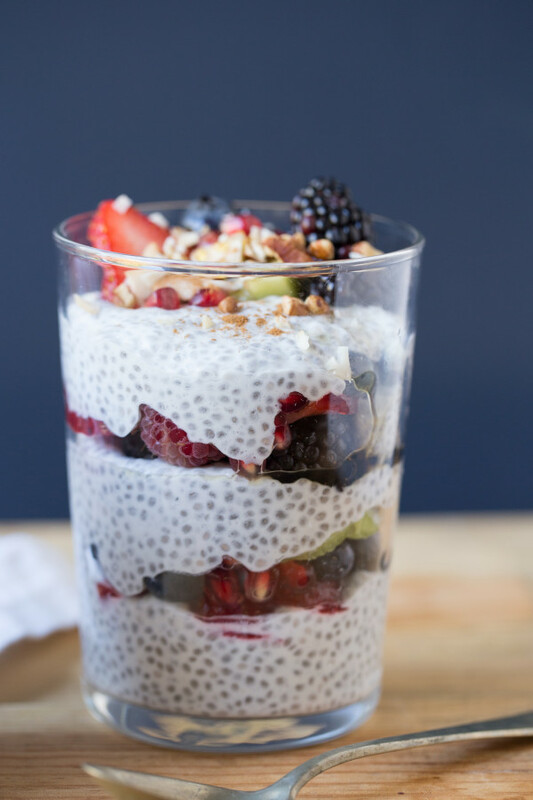 Serve chia seed pudding topped with assorted fruits, nuts, coconut chips, maple syrup and cinnamon.